Get paid fast using the payment system built into QuickBooks. Get paid instantly from inside QuickBooks. Easily accept payments using the payment system built-in to QuickBooks. Your customers can choose from a variety of payment options, like credit card, debit card, ACH bank transfer, Apple Pay, or other payment services. QuickBooks processes the payment, records the transaction in your books, and transfers the funds to your bank account. QuickBooks makes it easy to create and send professional invoices that include a ‘Pay Now’ button. Your customers can make an electronic payment via credit card, debit card, bank transfer, or via payment services like Apple Pay. The payment system inside QuickBooks processes the payment and tracks everything for you. Get paid anytime and from anywhere with the QuickBooks mobile app. It’s easy to enter credit card information into the app, or you can use our mobile card reader to swipe, dip, or tap a credit card. The QuickBooks payment system processes the payment, records the transaction in your books, and automatically transfers the funds to your bank account for you. 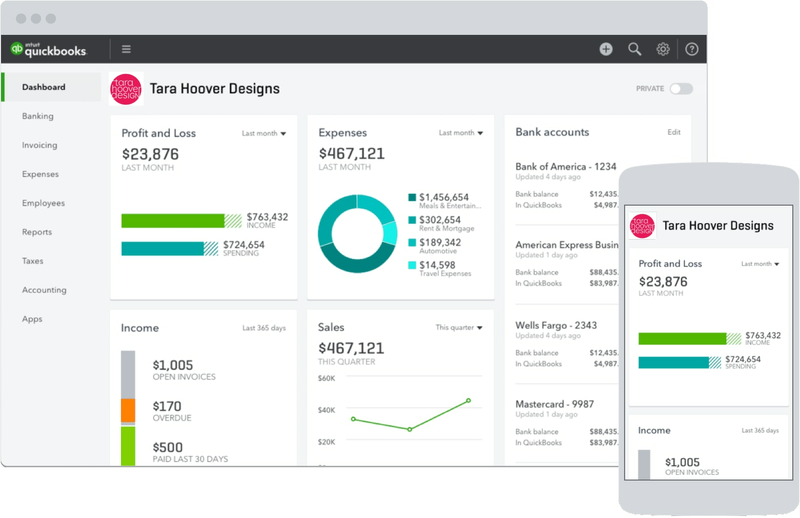 Explore the payment system inside QuickBooks. QuickBooks has a built-in payment system that processes credit card transactions. When you enter a payment into QuickBooks, we submit the request to the brand (like Visa or MasterCard) who sends it to the financial institution that issued the card. The transaction gets approved or declined and a response is sent back up the chain. This process happens in seconds. The ACH (Automated Clearing House) Network is a funds distribution system that moves money electronically. It is used for debit card transactions, direct deposits of payroll, Social Security benefits, and more. This is one of the most secure payment methods available today. ACH payments and eChecks are part of the same secure system and are processed for free by QuickBooks. Take payments with your mobile device using the QuickBooks mobile app. Plug in our mobile card reader to swipe, dip, or tap credit cards and ask your customer to sign directly on your phone or tablet (if a signature is required). Customers can include a tip and can choose to receive a receipt via email. The payment system inside QuickBooks take care of the payment processing. More than just a payment system. Run your entire business with QuickBooks. With over 50 built-in accounting and business reports, QuickBooks makes it easy know where your business stands. Keep tabs on your open invoices, customer balances, and past due amounts. Easily generate and share professional reports with your business partners, investors, or colleagues. Create a quote or estimate for a prospective customer before starting a job. With QuickBooks, it’s easy to create professional estimates that can include discounts, product SKUs, payment terms, and other line items. 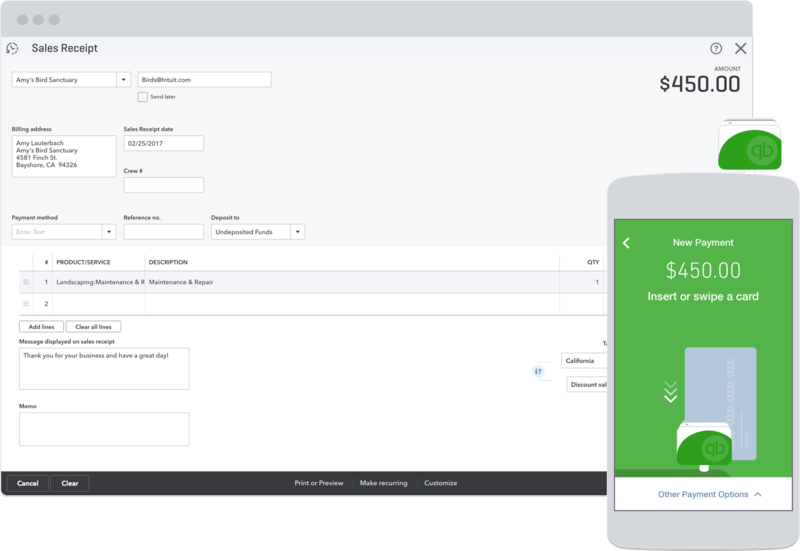 Once an estimate is accepted, QuickBooks converts it to invoices for you. Watch this video to see how to set up and use the payment system inside QuickBooks. An electronic check, an e-check, is an electronic version of a paper check. Today, the term e-check is largely interchangeable with ACH payment, but it still has some nuances that we explore here. Do you have a strategy for turning one-time buyers into repeat business? Here are four affordable tools that your small business can use to keep customers coming back. One of the most awkward situations in business is having to remind clients about late payments on a bill or invoice. Here are 20 tips that are designed to get clients to pay their bills by the due date or even earlier. What is a POS system for payment? A POS (point of sale) system refers to the software and hardware that manages sales transactions at the point of sale. In the past, sales transactions were mostly completed by cash register, but today’s point of sale systems are shifting to computers and mobile devices. QuickBooks integrates with today’s popular point of sale POS systems so that data from each sales transaction is entered into your accounting system for you. If you don’t use a POS system, not to worry. You can record sales transactions and accept payment directly inside QuickBooks.